The north-west wall of the Tumbler Ridge Health Centre features a row of forty sizeable windows. As of August 12th these windows feature eleven large colour images (each spanning two or three windows) of healthy aerobic activity in the Tumbler Ridge Global Geopark. Taken by local photographers, the images feature diverse activities: ice climbing, cross country skiing, hiking, mountain running, canoeing, mountain biking, swimming, caving, and snowshoeing. Each activity is set against a backdrop of the stunning scenery and geology of the Tumbler Ridge area. Similar technology has been used recently by Teck and Anglo American in Tumbler Ridge, featuring mining scenes on their downtown office windows. Such images are only visible from the outside; from the inside, the effect is simply that of a gently shaded room. 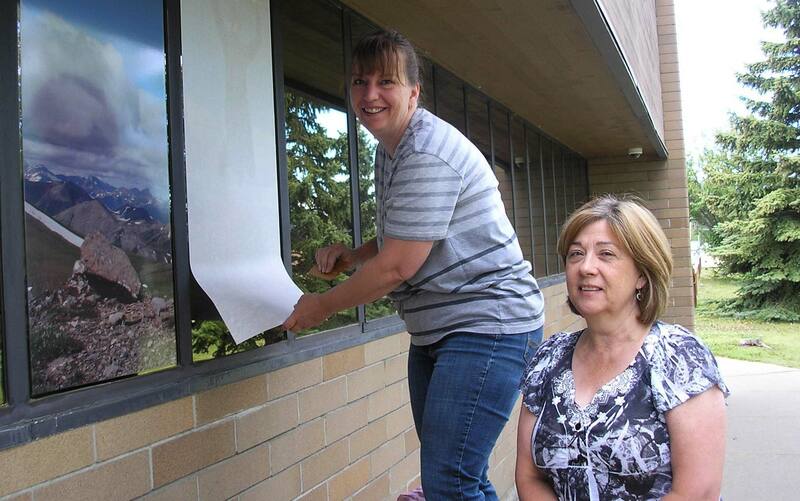 The window photos were installed by Leslie Fry of Signs and Things, Dawson Creek. The concept of the Downtown Walking Tour began with a request from Mayor McPherson for ideas on sprucing up the downtown core, making it more attractive for visitors and residents to enjoy. The Tumbler Ridge Global Geopark ran with the idea, helping to obtain funding from Northern Health through the Healthy Communities Fund, and securing donations from the Northern Lights College Foundation and from the Tumbler Ridge Community Forest. Complementing these window images in the near future, using these funds, will be large mural artwork by Tumbler Ridge artists depicting Geopark themes. One of these murals will be on the Health Centre wall beside the window images. In approving the application to the Healthy Communities Fund, Northern Health offered to increase the amount provided by $1,600, to allow for the addition of two benches. These will be installed soon by Public Works staff, to create a park-like atmosphere from which the art and images can be viewed. This project not only enhances the downtown core and celebrates the second UNESCO-supported Global Geopark in North America, but also promotes a key Northern Health objective of physical fitness and healthy lifestyles through aerobic exercise. The vision for future years includes developing the rows of windows on two other walls of the Health Centre building, theming them with sporting activities in town and health care delivery.